There's plenty of things from America to miss here, even if they are the kinds of things that make you blush a bit to admit. I wouldn't change the coffee or cafe culture here for anything in the world, but sometimes I want a frozen coffee to carry around and sip in the street, you know? America's got some things right. Take the bagel. I'm not a passionate bagel lover, but it is a special bread. No croissant, no baguette, no roll can really have the same effect, the same mouthfeel. So in cases like this, you have to take matters into your own hands. I've made baguettes, croissants, and the like, but never tried a homemade bagel. Turns out they're pretty much as easy as it gets. Stir, knead, form (which can be tricky at first, but gets easier). 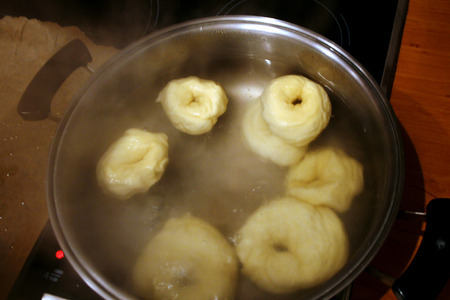 Then comes the step that makes a bagel a bagel: boil for a couple of minutes in water. Then off into the oven, where the signature outer crust is formed. Then it's just 20 minutes to perfect bagels. And fortunately cream cheese does exist here. And working on getting some Belle Chevre breakfast cheese across the pond. Mix all ingredients. Knead the dough until smooth and elastic, about ten minutes. Let it rest for 10-20 minutes. Break off a piece of dough (about 1/6 of the dough for full-size bagels) and roll it like a snake on the counter. Loop it around your hand and pinch the dough together, giving it a quick roll on the counter to fully unite the two ends. Set it aside and repeat with the remaining dough. Allow the dough bagels to rest for 20-30 minutes. Meanwhile, heat a large pot of water to a boil and your oven to 425. When your dough is ready, boil for one minute, flip and boil for one more minute. 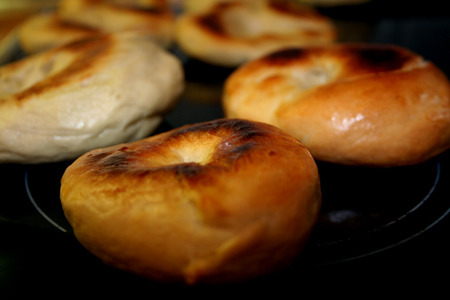 Remove bagels and allow them to air dry for a minute. 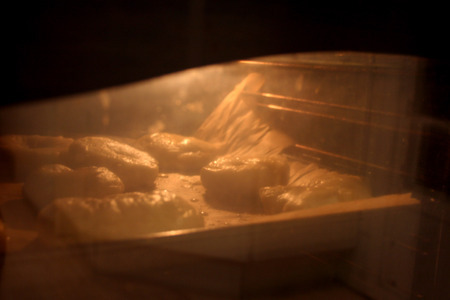 Then place them on an oiled baking sheet and bake for 10 minutes, flip, and bake 10 more minutes.